The Museum of Northern Arizona has a long history of producing informative and captivating publications about the Colorado Plateau, its land and people. MNA publications include Plateau Magazine, Research Bulletins, and several book titles. PLATEAU Magazine: The Land and People of the Colorado Plateau features issues relevant to the vast Colorado Plateau region with beautiful color photography and informative articles. Plateau explores the historical, natural, scientific, and environmental issues that have affected and are still impacting the Colorado Plateau. Every issue celebrates the diversity and splendor of this unique geologic and cultural region through multidisciplinary articles, striking color images, and historic archival photographs. Plateau magazine was originally published quarterly by the Museum from 1939 until 1994 and reinstated in 2004. Each issue is devoted to one theme. Many issues are now out of print. Back issues and single copies of Plateau are available for purchase as well as back issues of previous MNA publications: Cañon Journal, Plateau Magazine, and Plateau Journal. Plateau is provided as one of the many benefits to all MNA members at the Sunset Crater Colleague level and above. See our member page here for additional information about becoming an MNA member or call 928-774-5213, ext. 219. The Museum of Northern Arizona Bulletins are a technical or scientific publication series highlighting the research of MNA or individuals affiliated with the museum. 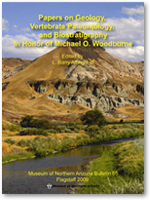 Bulletin 65 is a festschrift to Dr. Michael O. Woodburne, MNA Honorary Curator of Paleontology. 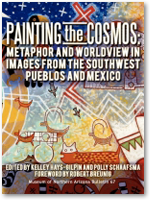 Painting the Cosmos presents current research on nearly two thousand years of ancestral Hopi painting and the values expressed in the imagery, settings, and performance contexts of paintings on kiva walls and pottery vessels. Nine essays show how continuity in Hopi values, such as reciprocity, humility, and hard work are expressed metaphorically in art, song, ritual activities, daily tasks, and visual arts.